There is steady progress at the site of the future world's tallest modular tower. According to ESD and Forest City Ratner, 246 modules out of approximately 960 have been delivered and installed to date. The 32 story tower is composed of three main volumes, each with their own unique facade articulation. 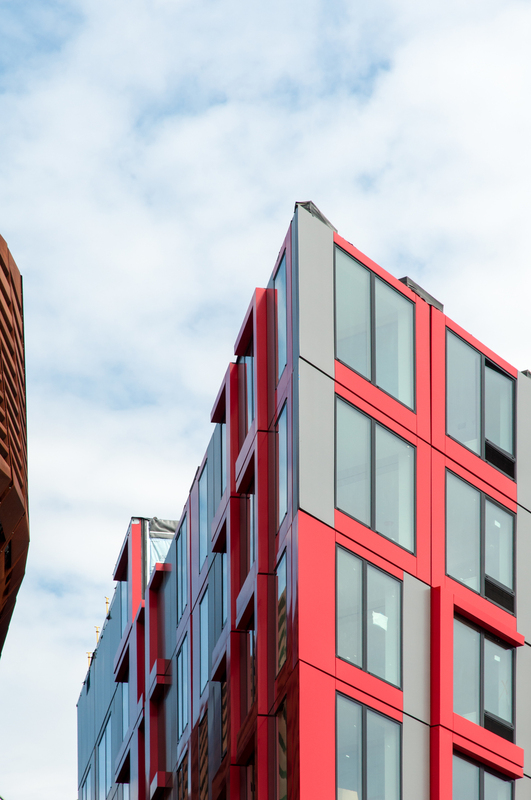 The red and grey paneled volume along Flatbush Avenue has approximately reached its half way mark in height, while the second volume of light grey panels along Dean Street has seen the installation of 4 out of 18 floors of modules. The third volume of the tower will rise above the lower two. When completed, the 346,000 square foot tower will bring 363 rental apartments to the area, half of which will fall under the affordable housing program. The west facade of the Barclays Center (left) and the B2 tower (right) on Flatbush Avenue. Detail of the corner facade at Flatbush Avenue and the Barclays Center arena. Detail of the Flatbush Avenue facade. The corner of Flatbush Avenue and Dean Street. Detail of the Dean Street facade. Corner detail of the Dean Street facade. The corner of the Dean Street facade. Looking west along Dean Street. Architects: SHoP Architects; Developers: Forest City Ratner; Program: Residential; Location: Atlantic Yards, Brooklyn, NY; Completion: 2015.